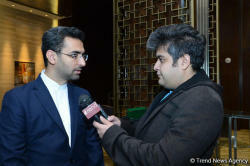 "I believe the private sector between Iran and Azerbaijan has a chance to reach agreements in the field of startups. Iranian embassy in Baku has established a special field in this regard to facilitate such cooperation," the minister told Trend on the sidelines of the three-day Bakutel 2017 in Azerbaijan. On the other hand, there is an existing political will for expansion of such type of cooperation, he added. 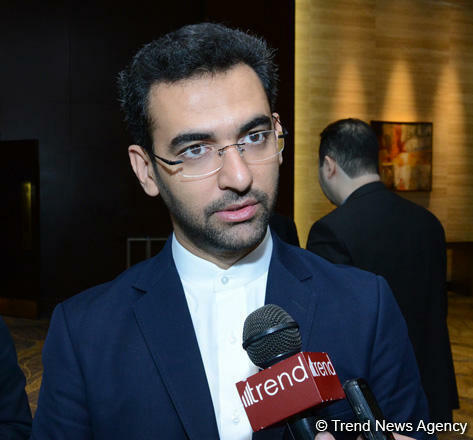 According to the minister, the cooperation between Iranian and Azerbaijani startup companies heavily relies on market demands. "The companies normally cooperate in a situation where there is atmosphere for developing business. There is an existing ground for cooperation between Iran and Azerbaijan, for instance in tourism and heath tourism sectors as well as transportation and agriculture. These fields are proper spheres for setting up startups, which can facilitate economic ties between the two nations." Saying that several Iranian startups have attended the ongoing Bakutel exhibition in Azerbaijan, he added that Iranian and Azerbaijani counterparts are studying the avenues for cooperation in the field of digital business. Azari-Jahromi further called on Azerbaijani companies to attend similar fairs in Iran to exhibit their products and find partners for joint cooperation. "Considering the existing ground for cooperation in the real world and the possibility of extending that into the virtual world, it appears that the capacity between the two countries regarding the startups is capable of growing," the minister concluded.